How to buy the Ticket Huayna Picchu? To buy the Huayna Picchu ticket it is necessary to book the tickets months in advance. Then you have to make the purchase process online. Payment is through PayPal (accepts Visa and MasterCard). Finally, you should only print the tickets and present them the day of the visit to the Waynapicchu mountain. The Waynapicchu mountain entrance is available 365 days a year. It must be considered that access is restricted to only 400 people per day, divided into two groups of 200 people each. Which web page is reliable to buy the Huayna Picchu ticket? What time does Huayna Picchu closes? There are many web pages available to buy the Huayna Picchu ticket. For security reasons, it is recommended to verify that the agency that represents the website is authorized by the Ministry of Culture of Peru. In ticketmachupicchu.com we have SSL security system. This system protects your personal data during the purchase process of the entry ticket. We are an agency authorized by the Ministry of Culture of Peru. We are the number 1 ticketing agency to the Wonder of the World through the internet. With us you can get your entrance to Huayna Picchu in 5 simple steps without leaving home. See online availability of Waynapicchu group 1. See online availability Huayna Picchu Group 2. To check availability simply check the number of tickets for sale in real time. The ‘0’ means that all entries were sold out. The ’50’ indicates that there are still fifty tickets available. If you find availability on the day and group of the Waynapicchu ticket, just click on the ‘book now’ button and complete the form. The required information is used exclusively by the Ministry of Culture of Peru to make the purchase of the ticket. Once the reservation form is completed, you must send an email with your passport or identity document in digital format. In the case of university students, send the digital copy of the valid university card. With this document, students have access to a special discount. There are also discounts for minors (8 to 17 years old) and citizens of Peru, Colombia, Ecuador and Bolivia. To access this benefit, the passport or identity document must prove the correct age and nationality. In the case of booking with us, the sending of documents is to info@boletomachupicchu.com. The validity of the documents is important. In case these are expired, they will not be accepted in the entrance control to Machu Picchu. After sending the required documents, a ‘Paypal Invoice’ will be sent to you. This payment method is the most used and recommended because it accepts Visa, MasterCard and American Express credit and debit cards. This invoice specifies the details of your reservation such as: the total amount to be paid, the type of ticket and the date of your visit. If you already have a PayPal account, you should only accept the payment invoice. Otherwise, you must create a new account, enroll a credit or debit card and accept the payment. We also have other payment methods. Payment must be made as soon as possible. Otherwise, there is the possibility of losing the reserved Huayna Picchu ticket space. Once the payment of the Huayna Picchu ticket has been made, the tickets will be sent to the inbox of your email in a maximum time of 24 hours. If the payment was made on the weekend (Saturdays and Sundays), the tickets will arrive in a maximum of 48 hours. To enter the Waynapicchu mountain, you simply have to print the tickets and present them in the Machu Picchu control booth on the day of your visit. The access gate to Huayna Picchu is inside the Inca City. 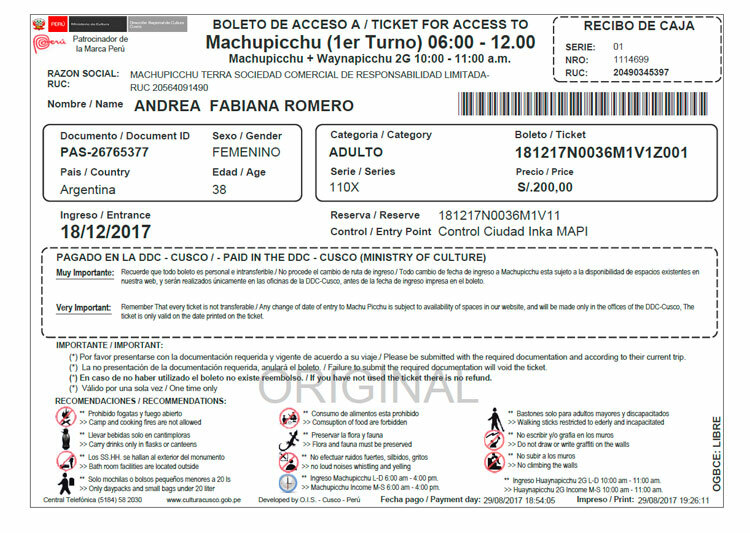 In the control post of access to Machu Picchu you will be asked for the identity document or passport with which you made the purchase of your ticket. Remember that if you do not present this document, you will be prevented from entering. The student rate is applied to undergraduate students under 25 who have a valid university card. In our ‘Tips’ section you will find everything you need to know about the Waynapicchu visit. The prices of the Huayna Picchu ticket vary depending on the nationality and age of the visitor. If you want more information visit our Machu Picchu prices section . The entrance to Huayna Picchu is allowed only to people over 12 years old. The ascent is not recommended for people who suffer from fear of heights. Huayna Picchu remains open 365 days a year except emergency situations or maintenance. For example, in April 2016, Machu Picchu announced the suspension of entry of visitors to the Huayna Picchu and Machu Picchu mountains. This measure was adopted to facilitate the integral maintenance work to: stairways, platforms and support walls. Despite the suspension, the Inca City of Machu Picchu remained open. We recommend taking into account the closing dates previously announced by the Machu Picchu authorities. 1) Can I access discounts for the ticket Huayna Picchu with ISIC card? No. Currently, the ISIC student card is not valid to buy any type of Machu Picchu ticket at a discount. The valid university card is the only valid document for the student discount. 2) Where is the entrance to Waynapicchu Mountain located? The entrance to the mountain Huayna Picchu is located within the archaeological site of Machu Picchu. The entrance control is located north of the Inca City, right in the sector of the Sacred Rock. 3) What to do if there is no availability in Waynapicchu? If there is no longer availability for the ticket Machu Picchu + Huayna Picchu, unfortunately there is nothing left to do. Remember that this ticket must be purchased 3 months in advance. 4) Can I enter Machu Picchu with the ticket Huayna Picchu? 5) How long in advance should I buy the entrance to Huayna Picchu? It is advisable to buy the entrance to the Waynapicchu mountain 3 months in advance. If you plan to visit during the high season of tourism (from April to October), the reservation must be made 4 months before. 6) Can I pay the ticket Huayna Picchu with a Visa card? The official website only accepts ‘Verified by Visa’ cards. In ticketmachupicchu.com we accept any type of Visa card through PayPal. 7) How much time do I have to pay the ticket Huayna Picchu? Once the reservation is made, the visitor must pay the entrance as soon as possible. Otherwise, another tourist can do it before and take the requested ticket. 8) How to pay the ticket Waynapicchu if I do not have a credit card? The official site of the Ministry of Culture of Peru only supports ‘Verfied by Visa’ cards. If you do not have one, you can not reserve your ticket. However, at ticketmachupicchu.com it is possible to make the payment through Western Union or a bank transfer. 9) What to do if you lose the ticket Huayna Picchu? The entry remains in PDF format in the visitor’s email. In case of loss, it should only print it as many times as necessary. 10) Can I book the Waynapicchu ticket for next year? Tickets reservations from one year to the next are available only in mid-December. In ticketmachupicchu.com you can ensure your entrance time before. The sending of tickets is at the end of the year. 11) With the purchase of the ticket Huayna Picchu can I stay all day in Machu Picchu?